Neurodegenerative disease or neurodegeneration is disease which is causes the progressive damage or wear and tear of the nerve cells. This disease causes loss of abilities like decision making and eventually memory loss. This diseases are debilitating and incurable conditions which results in progressive degeneration of neurons and lead to problems with mental functioning and movement. Major cause of neurodegeneration could be deposition of toxic protein substance in the brain or loss of functionality/improper functioning of mitochondria present in brain. Patients generally show mixture of symptoms for one or more neurodegenerative disease. The prevalence of these conditions is on a constant rise across the globe, yet there is a general lack of effective therapies to treat the same. Geographically North America dominated global neurodegenerative disease market, due to advanced medical infrastructure and approximately half of the world’s procedures being done in the U.S. because of high medical reimbursement facilities, and technological advancement. Asia Pacific is projected to have fastest growth, owing to rapidly increasing population, rise in consumer awareness, favourable government policies, modernization of healthcare infrastructure, and growing medical tourism industry in developing nations such as China, and India in this region. This report identifies the peripheral intervention market size in for the year 2016-2021, and forecast of the same for year 2021. 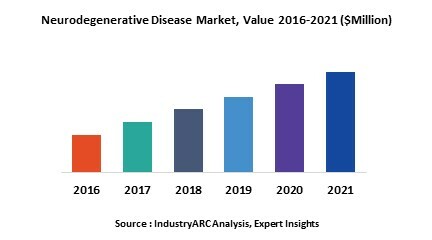 It also highlights the potential growth opportunities in the coming years, while also reviewing the market drivers, restraints, growth indicators, challenges, market dynamics, competitive landscape, and other key aspects with respect to Neurodegenerative Disease market. This is report has been further segmented into major regions, which includes detailed analysis of each region such as North America, Europe, Asia-Pacific (APAC) and Rest of the World (RoW) covering all the major country level markets for Neurodegenerative Disease in each of the region.